Book before 18th December to save £50 on the March 2017 Drawing on the Right Side of the Brain course in central London. Drawing is a skill that can be learned. You can learn to draw in as little as 5 days. 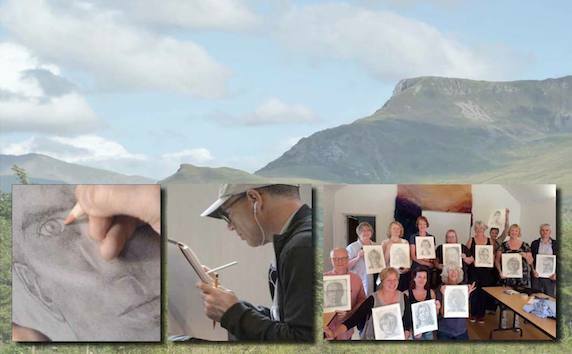 Whether you are a complete beginner or perhaps you would just like to develop your skills and confidence, particularly at drawing from life, then this 5-day Drawing on the Right Side of the Brain workshop is for you. Information about the content 5-day Drawing on the Right Side of the Brain course, devised by Dr. Betty Edwards. Loosening up: Drawing with Light Some tips to help you bypass the critical mind. Anna teaches in the UK in central London (Little Venice), which are non-residential, and North Wales, near Bangor, (residential). 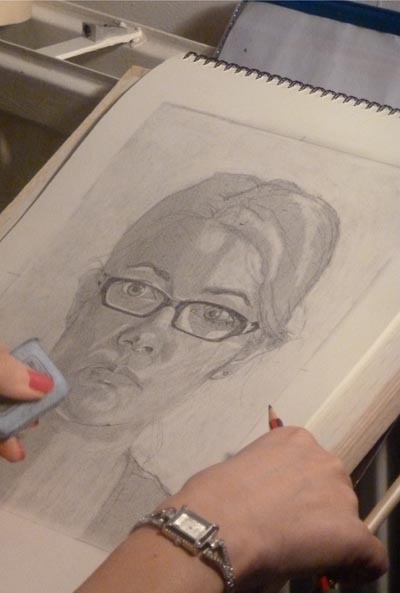 The course lasts for 5 days (9.30am-5.30pm) and includes 35 hours of teaching and The Drawing Portfolio (RRP over £80). The cost for the course and all materials is £525 (there is £50 early bird discount see below). There is an additional charge for board and accommodation on the residential courses. This course is filling up fast. The Course Fee does not include accommodation or full board. There is an additional cost for this which varies depending on the room. (£450 for 5 nights full board for single ensuite to £385 for 5 nights full board single with shared facilities). This course is down to its last few places. What do people who have done the course already think? "Wonderful with incredible improvement, easy steps building on each other. I loved it. Great group of people; easy-going, non-competitive and fun!" Sometimes when we try and ‘draw’ everything we can get quite uptight and tense around trying to get it right. One way to loosen up is to let go of drawing and instead focus on finding shapes of light and dark. Begin by covering your drawing paper with a layer of graphite or charcoal and rub it down to get a smooth surface. Set up your subject with a strong light source to create strong light and shadow shapes. You can use a reading light in a darkened room. Have a white plastic eraser and a putty eraser as well as pencils. Start looking for the largest shape of light. Take a moment or two just to look. Keeping your eyes on the subject and using one of the erasers, begin to erase out the shapes of light. Noticing how each connects with another. Looking for relationships with vertical and horizontal alignments. The white plastic eraser is good for strong lights with clean edges. The kneadable putty eraser is good for exploring tones and softer transitions. Continue in this way and if necessary, work on the darks with your pencils. Always work from large general shapes to smaller more specific areas. it can be helpful to squint to see shapes more clearly. The 'right brain' or R-Mode loves finding meaning in shapes therefore when we 'draw' with light in this way, we can bypass the critical mind and encourage R-Mode to take over the drawing task. A smudge here or there and suddenly a mouth or a nose will appear... Try it and see!